About a week after we left New York, Henri & I had the incredible privilege of being able to visit a special place in North Carolina, the Spruill Farm. A wonderful thing about the company where I used to work, Meetup, is that its employees are kind-hearted, beautiful people. So one of my former managers connected me with her Dad’s farming project located about one hour from Elizabeth City. Henri and I were very curious about it and incredibly grateful to be granted access to a place we wouldn’t have found by ourselves. I was also a perfect photography subject on this sunny day. We wish to donate our farm on the SW shore of the Albemarle Sound in North Carolina for perpetual conservation and some combination of low-impact public access, organic farming or at least sustainable farming, environmental research and restoration, and education programs. The farm has 110 acres, 75 of which are in cultivation, and 1,600 feet of undeveloped shoreline on the sound. 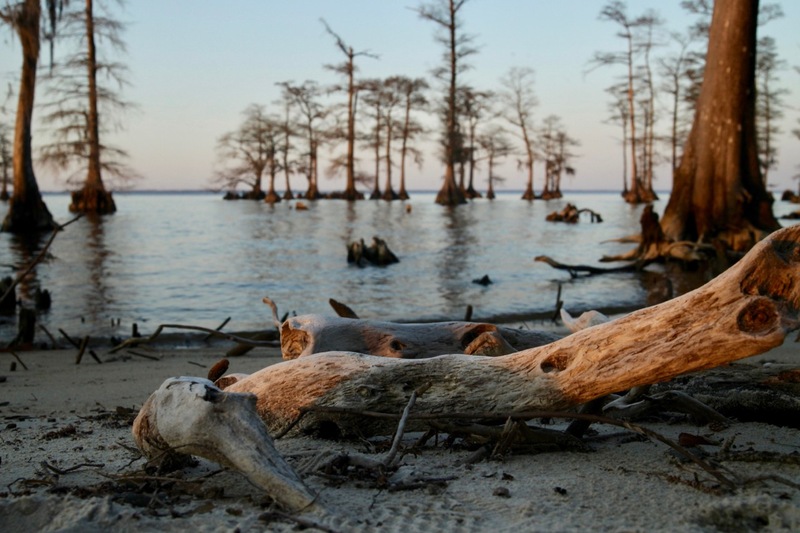 The Albemarle is the largest freshwater sound in the world. As soon as we arrived there, we knew we wanted to connect with the place a little longer than one afternoon. A 10-minute walk led us to an amazing dispersed campsite connected to the farm on the Albemarle Sound. There is very little public access on the Albemarle Sound, so imagine how lucky we felt to be allowed to stay. The temperature was good enough to camp. It turned out to be our first night sleeping in the van, as the past 2 weeks had been way too cold and we had been stuck in motels. We could not have dreamt of a better place to try out the van for the first time. I went all the way to Lake Baikal earlier in my life to find that sort of peacefulness. It was a perfect place on earth. We made fire and the night went great. During the day I found out how to play with the aperture priority mode on my camera. I got a nice shot of two bald eagles perched together on a cypress tree. I was told by my host that it was the first time someone witnessed this at the farm! Check out and like the Spruill Farm Conservation Project Facebook page. There is also a Meetup Group, Community Farm on the Albemarle. Thank you for helping tell our story. We welcome all visitors who, as you did, practice low-impact visiting. We are very pleased you were able to visit and enjoy the farm, and apologize for not being there to greet you. Please visit again when you are in the area! Hi Clay! We will definitely come back as soon as we’re back in NC 🙂 Thank you. These are beautiful pictures, and I recognize every spot where they’ve been taken. I hope my children will get to visit the farm one day as their great grandfather was born and lived there. This farm told us all our family history, and answered all the questions about it. This is a peaceful place you want to go back to and enjoy over and over again. Great pix once again and good work on that fire! I like the one where Henri imitates the alien in ET. What a good movie!